Indian Army Surgical Strike anniversary on Pakistan Live Update: Former Indian Army Chief General Dalbir Singh Suhag today revealed that the cross-border operation in Jammu and Kashmir had full backing of Prime Minister Narendra Modi. Surgical Strike anniversary by Indian Army on Pakistan Live Update: Former Indian Army Chief General Dalbir Singh Suhag today revealed that the cross-border operation in Jammu and Kashmir had full backing of Prime Minister Narendra Modi. Suhag, who was the chief of Indian Army when the opetation was carried out, said that the PM had approved the recommendation that Army had forwarded to him. He said that “we wanted to send a strong message to Pakistan that we can cross LoC, we can hit them, cause major damage and also return without casualty”. “This was a difficult option, more challenging, but we exercised it to send a message that we can do it,” he told news agency ANI. Meanwhile, the ruling Bharatiya Janata Party (BJP) has released a video on its twitter account to “salute the unmatched valour of brave soldiers who conducted surgical strikes” across-border in Jammu and Kashmir in 2016. The nation is today celebrating the second anniversary of surgical strikes that were conducted by jawans on Pakistani terror launchpads across the Line of Control (LoC) on the intervening night of September 28-29 in 2016. 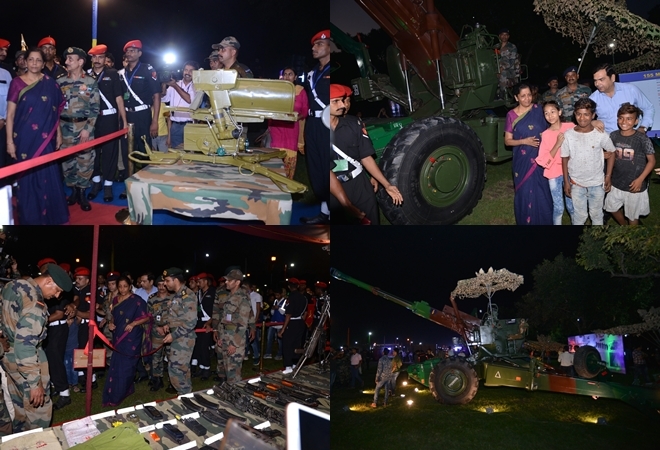 The three-day celebrations – ‘Parakram Parv’ kicked-off on Friday evening with Defence Minister Nirmala Sitharaman opening an exhibition at the India Gate lawns in Delhi. The Bharatiya Janata Party today attacked the Congress party for questioning the Indian Army over surgical strikes. The party today released a video of Congress leaders -- Sanjay Nirupan and Sanddep Dixit in which they can be heard raising questions over the claims of cross-border operation. What defence equipment are on display at exhibitions ? Modern defence equipment such as tanks, artillery and radar are being showcased at all 53 locations in 51 cities. The weapons that are being displayed to general public include rocket launcher Pinaka, multi-barrel rocket launch system, Arjun tank, strike vehicles and Rudra aircraft, among many others. The Congress party has claimed that the 2016 operation was not the first time that Indian Army had undertaken surgical strikes. Addressing the media last evening, Congress spokersperson Randeep Surjewala listed a number of such attacks carried out in the past. He said: "We are proud that our forces have successfully conducted multiple ‘surgical strikes' over last two decades, particularly post the year 2000 -- January 21, 2000 (Nadala Enclave, across the Neelam River); September 18, 2003 (Baroh Sector, Poonch); June 19, 2008 (Bhattal Sector, Poonch); August 30-September 1, 2011 (Sharda Sector, across Neelam River Valley in Kel); January 6, 2013 (Sawan Patra checkpost); July 27-28, 2013 ( Nazapir Sector); August 6, 2013 (Neelam Valley); January 14, 2014 (Army Chief, General Bikram Singh's statement qua surgical strike on December 23, 2013); September 28-29, 2016 (DGMO's statement)." Defence Minister Nirmala Sitharaman today said that the military action at the border will continue. "I would believe an action of this kind would deter Pakistan from training and sending terrorists. My action will continue at the border irrespective of whether they have learnt a lesson or not." The Congress party has accused the BJP government of politicising the 2016 surgical strikes. The party said that the BJP is using 'soldiers as a tool to garner votes' ahead of the general elections. The Bharatiya Janata Party has released a video on its official twitter account to salute the unmatched valour of our brave soldiers who conducted surgical strikes. The teaser of upcoming military drama 'URI' is out. Produced by Ronnie Screwvala’s RSVP, the film is based on the Indian Army's 2016 surgical strike. The teaser was released on the eve the second anniversary of the cross-border operation. Singer Kailash Kher and lyricist Prasoon Joshi have teamed up for a song to mark the 2016 surgical strikes by Indian Army. The song is titled 'Mera desh meri jaan hain' and it goes like - “Mera desh meri jaan hai, mera garv hai abhimaan hai, aur yeh abhimaan hai zinda kyunki seema par veer jawaan hai. Jal ho zameen ya aasman, kabhi jhuke nahi bharat ki shaan... Mere desh ke jawan, tujhko shat shat pranam”. The song is sung by Kailash Kher. The singer will be performing the song with his band 'Kailasa' at India Gate in Delhi on September 30. Union Home Minister Rajnath Singh said that "something big has happened in the past two days". Speaking on the eve of surgical strike day, Rajnath said while referring to the killing of soldier Narendra Singh by Pakistani forces, said: "Something has happened, I won't disclose it now. Whatever has happened, has happened for the good. Trust me, something big has happened two-three days ago. And you will also see what happens in future." "I have told the BSF jawans, don't fire the first bullet, as they are our neighbours. But if they fire the first one, don't count the number of bullets you fire back." 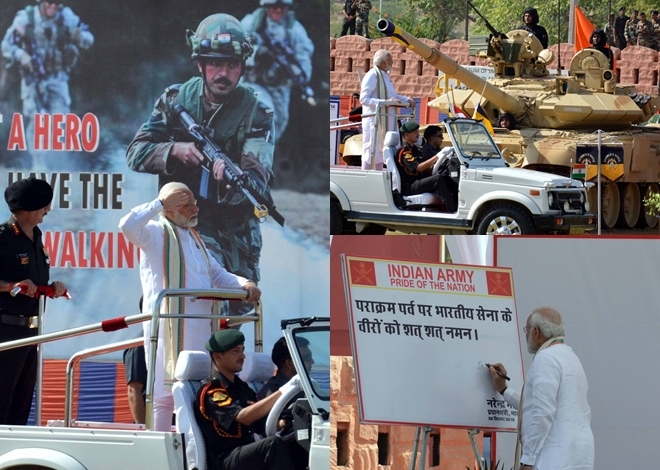 Prime Minister Narendra Modi on Friday inaugurated 'Parakram Parv' at the Jodhpur military station to commemorate the second anniversary of the surgical strikes. Upon his arrival at the Jodhpur airport, PM Modi went straight to Konark War Memorial where he offered floral tributes to the martyrs of 1965, 1971 and other wars. He then went to the Konark Stadium where he inaugurated the 'Parakram Parv'. Meanwhile, thousands of visitors flocked to the venue to have a look of the defence equipment on display. Various commemoration events were organised at the Indian Army's Western Command on Friday to mark the second anniversary of the surgical strikes. A defence spokesman said that several events have been planned at the Hisar military station to showcase the gallant action of the Armed forces. 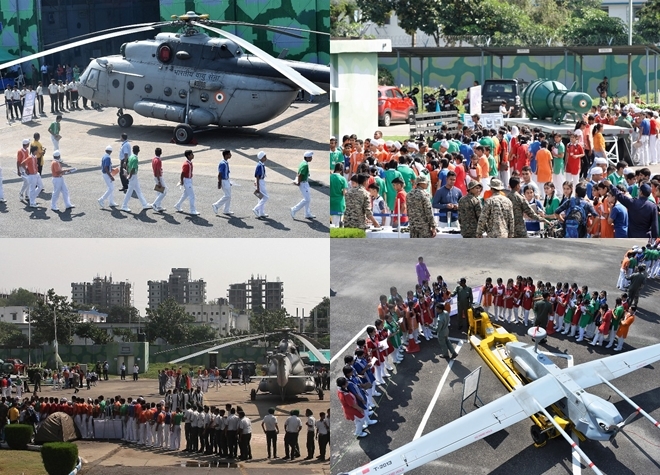 "This includes showcasing of weapons and equipment, live demonstration on the might of mechanised forces of the Army, motivational movie on the life of soldiers on the LOC and visit to war memorial by schoolchildren," the spokesman told news agency IANS. On Thursday, the government had released a new video of the 2016 surgical strikes conducted by the Indian Army. The video was released to media just two days before the second anniversary of the Army's cross-border operation. According to the government, the drones and thermal cameras were used to capture the footage. The three-day 'Parakram Parv' to mark the 2nd anniversary of the Indian Army's surgical strikes kicked-off last evening. On Saturday and Sunday, the events will be organised at 53 locations in 51 cities. General public can visit these exhibitions between 11 am and 10 pm. Weapons that were captured by Army from terrorists, other military equipment will be put on display. Visitors will also get opportunity to see several short films, photographs depicting the valour and courage of the armed forces. Several letters of school children addressed to soldiers will also be put on display. Prime Minister Narendra Modi on Friday inaugurated an event at the Jodhpur Military Station organised by the Konark Corps. He also attended the Combined Commanders' Conference during visit to the military station. Defence Minister Nirmala Sitharaman on Friday opened an exhibition in Delhi to mark the second anniversary of the 2016 surgical strikes across the LoC in Jammu and Kashmir. The exhibition is being organised at the India Gate laws. Sitharaman said that the operation was a strong message to the world that India will not tolerate terrorism and that the killers of the soldiers will not go unpunished. The Indian Army had conducted surgical strikes on the intervening night of September 28-29 in 2016. Several terror launchpads of Pakistan Army-backed terrorists were destroyed and as many as 40 militants were killed by the jawans across the Line of Control (LoC) in PoK. The decision to conduct an operation across the border was taken days after the Uri terror attack that was carried out by the banned terror group LeT. On September 18, 2016, four heavily armed Pakistan-backed militants had attacked an Army station in Uri town of Jammu and Kashmir, causing severe damage and leaving 18 soldiers dead. The attack was the deadliest attack on security forces in the border state in last two decades.